Evan Oustrich (second from right), an AmeriCorps member with the Human Concerns Center, displays some of the backpacks that he has collected in support of the annual Stuff-A-Bus Campaign. Donations of new and gently used backpacks are being accepted at the Human Concerns Center as well as the Mexico and Oswego public libraries, Oswego YMCA, and Kinney Drugs in Mexico. Pictured with Oustrich at a recent meeting of the Oswego Noon Rotary Club from left are: Rotary member, Diane Dillon, Deb Deeb of Human Concerns, Rotary member, Randy Zeigler and Oswego Noon Rotary Club President, Melanie Trexler. OSWEGO, NY – Human Concerns, Oswego’s emergency food pantry is joining area businesses and organizations in collecting back to school items in support of the annual Stuff-A-Bus campaign. 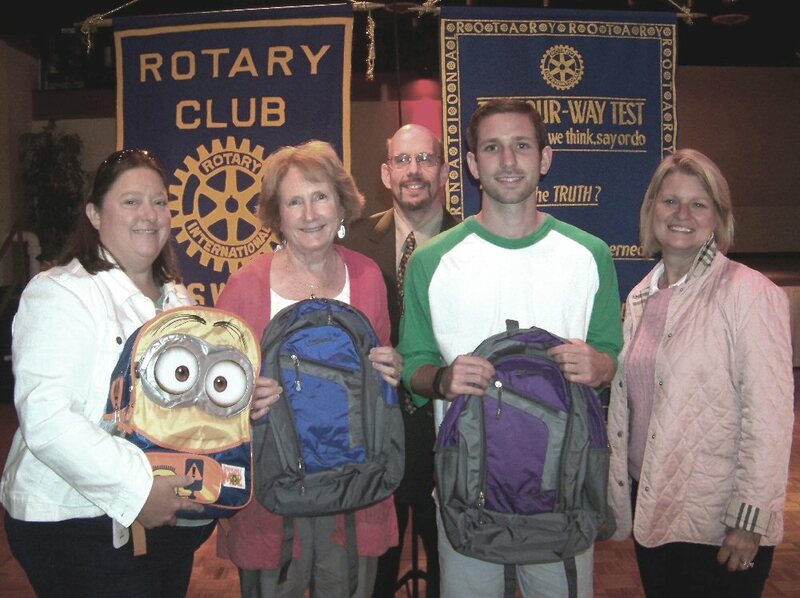 As part of his community project, AmeriCorps member Evan Oustrich, who is currently working with Human Concerns, has organized a drive to collect backpacks for distribution to children in need throughout Oswego County through the annual Stuff-A-Bus campaign. Now through August 20 Oustrich will be accepting donations of new and gently used backpacks at the Human Concerns Center, 85 E. Fourth St., Monday through Friday, noon to 3 p.m. and Saturday 10 a.m. – noon. Working in collaboration with United Way of Greater Oswego County, other area school districts, and more than 20 business and organizations, the Stuff-A-Bus campaign collects donations of school supplies for distribution to less fortunate students throughout Oswego County. For more information on Human Concern’s Backpack Drive, contact their office at 315-342-7301. For more information on the Stuff-A-Bus campaign contact the United Way at 315-593-1900, Melanie Trexler or the Oswego City School District Superintendent’s Office 315-341-2001, Jo Ann Conzone.